This essay describes the meaning of leadership and defines the characteristics and qualities of effective leaders. It discusses the manner in which leadership skills can be developed and assesses the importance of leadership in organizations seeking to achieve specific aims. Leadership styles, such as servant leadership and transformational leadership, are analyzed and qualities such as boldness, good judgment and emotional intelligence are examined to show how they support effective leadership. The paper concludes with a discussion of what leadership means to different people and how leadership styles can reflect an individual’s own subjective take on leadership and how it should be demonstrated. 6.7 What Does Leadership Mean to Me? 6.8 What Does Leadership Mean to You? How can leadership qualities be promoted? How does a bad leadership experience impact a workplace culture? H. What Does Leadership Mean to Me? I. What Does Leadership Mean to You? As Schyns and Schilling (2013) show, organizations thrive on effective leadership and suffer in numerous ways from bad leadership. Leaders are responsible for projecting the vision and values of an organization and for making decisions based on good judgment that will ultimately benefit all stakeholders in the long run. While there are many styles of leadership—from transformational leadership to democratic leadership to servant leadership—there are certain characteristics that are common among all effective leaders. This paper will examine leadership characteristics and show how they can be developed in tomorrow’s leaders. Leadership is defined as the ability to “empower followers” (Conger 17) through guidance, example, and encouragement. Leaders vary in terms of style: some are bold and transform their followers by instilling in them a vision of what they can achieve and how to achieve it. Other leaders are humble and inspire their followers by serving them, identifying their needs and ensuring that those needs are fulfilled. In either case, the objective is the same: leaders seek to motivate their followers to reach their maximum potential. A leader is one whose primary concern is with the positive and progressive direction of the organization of which he is a part: his concern is not with his own standing or achievements but rather with the success of those around him. If a leader is not focused on helping his followers succeed, then he is more likely to be a destructive leader than a constructive and effective leader. Leadership is not a new idea. Civilizations throughout all history have recognized leaders and celebrated good leadership in a variety of forms. Generals like Julius Caesar, statesman like Solon and Pericles, artists like Wagner and Shakespeare, religious men like Augustine, philosophers like Socrates, social justice advocates like Malcolm X and Martin Luther King, Jr.—all of them have been lauded as possessing the qualities and characteristics of leadership. What is it that sets them apart? The “Great Man” thesis posited that leaders are born—yet as ideas of leadership have evolved over the centuries (especially in the modern era), new theories have formed that raise new questions about leadership and shed light on new aspects of leadership development. For example, many researchers are now focusing on how leadership skills can be promoted among adolescents (Morton & Montgomery, 2013; Larson & Tran, 2014; Marshall, Parker, Ciarrochi & Heaven, 2014). Their studies indicate that leadership youth programs can be helpful in providing adolescents the tools and experiences they will need in order to develop leadership traits. These same studies have shown that family stability and self-esteem also play a large role in helping young people to grow leadership qualities, such as emotional intelligence, good judgment, boldness and creativity. At the same time, not everyone possesses the same congenital gifts and talents, and some individuals are more predisposed to embracing leadership positions than others. Thus, even though research shows that leadership styles, skills, and characteristics can be learned, evidence still exists that some leaders are born with a natural talent for leadership. These seven characteristics help to define the concept of the leader. At the heart of this concept are the elements of boldness and good judgment. Together, these elements help support a leader’s character and ability to execute the other aspects of leadership. 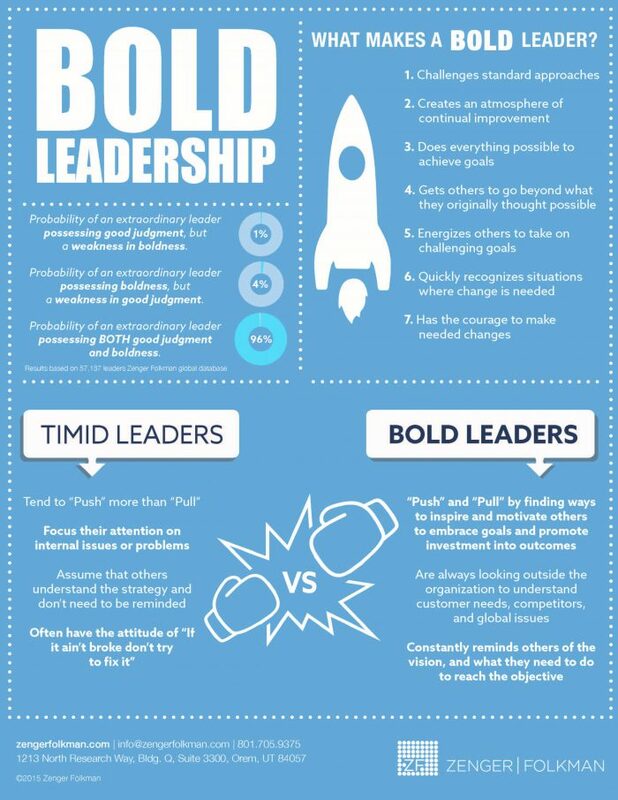 Boldness helps a leader to challenge the status quo, to turn standard operating procedure on its head and look for new and innovative processes that can more effectively achieve organizational aims. Boldness helps a leader to be creative, to think outside the box, to collaborate with others and imagine possible solutions to problems. Boldness helps a leader to achieve success, to keep driving towards the goal despite setbacks and obstacles. Boldness inspires perseverance, dedication, commitment and creativity in others. It energizes a group of followers, who can draw emotional, intellectual and social support from a positive leader who is willing to give feedback, advice, guidance and assistance whenever necessary—but who is also willing to listen, include, consider, and reflect. These latter qualities are part of the good judgment side of an effective leader. Good judgment stems from one who is reflective, who is thoughtful about what goes on around him, who considers the viewpoint of others, including all stakeholders, and who listens so as to better understand the facts. Good judgment helps a leader to make an accurate assessment of a situation, to gather all the relevant information and data, and to read the layout. Good judgment enables a leader to then decide on the right course of action, to try a procedure that makes the most sense given the information presented. Together, boldness and good judgment form the heart of good and effective leadership. Effective leaders are ones who can harness the skills and abilities they possess in order to marshal their followers towards the achievement of the organizational goal. The goal should be defined by the leader for the followers, with a vision of the process by which the goal may be achieved clearly provided to the followers so that they have a concrete picture of what is expected of them. For a leader to be followed, he must be clear, concise and comprehensive. A leader must also be one who is trusted by his followers. This means a leader should possess qualities that support trust in a relationship—such as honesty, integrity and transparency. A leader should have the ability to communicate well with others: his body language should be expressive of confidence but also of empathy and interest in what his followers are doing. Empathy is a major part of emotional intelligence, which has been shown to play a fundamental role in effective leadership (Sanders, 2006; Cacamis & El Asmar, 2014). Emotional intelligence is the tool whereby an individual is able to read another person’s emotional output and respond with the appropriate words, gestures, expressions or ideas that help to support, stabilize, and develop the other person’s emotional state. Empathy enables an individual to put himself into another person’s shoes, so to speak—to see the world through that person’s eyes and obtain a feeling for what that person is likely experiencing at the moment. In nursing, empathy is important in providing optimal quality care. In management, empathy is important because workers need to know that they are appreciated, respected, supported, and understood—otherwise conditions for resentment, ill will, and neglect can be fostered. A leader who demonstrates emotional intelligence is a leader who will work to create positive organizational culture that is based on mutual respect, appreciation, and consideration. Servant leadership is a style of leadership that enables a leader to put the needs of followers before his. The concept of servant leadership may seem incongruous at first (how can a leader be a servant?) but it is actually reflective of the fundamental reality of what it takes to be an effective leader: a leader truly must serve—either a higher vision or purpose (such as an organizational aim) or the needs of his followers (i.e., the leader helps the followers by supporting them as they develop their own skills and grow into the type of worker that will achieve goals and overcome obstacles). As Hunter, Neubert, Perry et al. (2013) note, a servant leader is one who acts as a role model, who inspires by his humble example, and whose agreeableness allows him to help others and serve them by fulfilling whatever needs they may have, whether personal or work-related. The servant leader is one who demonstrates true and observable care and concern for his employees or followers and whose main concern is to make sure that they have everything they need to get the job done. A servant leader dedicates himself to his followers and leads essentially from behind, and Jesus Christ is often identified as a prototypical example of the servant leader. Transformational leadership is a style of leadership that focuses on leading from the front: the leader targets specific developmental goals for his workers and trains them in the method and manner of growth by which those goals may be achieved. The transformational leader, like the servant leader, is focused on building followers into highly effective and self-sufficient workers—but the approach is oriented more towards setting goals and then giving followers the tools needed to achieve the objectives. Emotional intelligence is particularly important for transformational leaders because it provides the leader with a sense of how to communicate most effectively to his followers in order to elicit the necessary responses. An example of a transformational leader in the 20th century is General George S. Patton, whose methods of inspiring and motivating his soldiers to achieve objectives were rooted in the transformational style of leadership—i.e., identifying clearly obtainable goals and then motivating and training individuals to achieve their objectives. Confrontational leadership is another leadership style that has been used by leaders in the past. One of the most notable examples of a confrontational leader is Malcolm X, who took up the issue of social justice and confronted numerous authority figures around the nation as he sought to establish principles of truth and justice among his followers. Eubanks, Antes, Friedrich et al. (2010) define the confrontational style of leadership as one in which the leader puts forward a policy and challenges others to conform to it. This type of leadership is very bold and is only supported so long as the policy put forward by the leader is based in good and true principles. Recent research has uncovered a need for organizations to develop “effective leaders and leadership behavior” (Day, Fleenor, Atwater, Sturm & McKee, 2014, p. 63). The development of leadership behaviors is something that organizations are finding is necessary in the 21st century because many firms, groups, and businesses require a firm hand at the helm in order to steer the many parts of the ship. Without the necessary leadership characteristics firmly possessed, the individual tasked with leading his followers will be ill-equipped to provide any actual help. He will, in short, be a bad leader whose effect is corrosive on the organization (Schyns & Schilling, 2013). To prevent a negative influence on a company’s culture, businesses see the need to develop leadership skills in individuals. Youths are receiving more and more attention as discussion grows of where tomorrow’s leaders will come from. Training young people to embrace the challenges, responsibilities, duties, and ethics of effective leadership is now seen as an essential part of the overall grooming of the next generation of leaders. Students can develop leadership skills by applying to and taking part in youth programs that focus on acquiring leadership techniques, ideas, and qualities. These programs are often spearheaded by organizations, after-school program administrators, church groups, organizational development teams, clubs, and other activities-related enterprises. Students can participate in these programs beginning at a very early age: Boy Scouts of America, for instance, teaches leadership skills to children and educates and trains them well into adolescence. Students can also grow their leadership skills in school by taking part in student government and other extra-curricular activities, such as athletics, drama, music, debate, etc. The research indicates that students are open to new experiences because they are defining their own identity and their own principles as they mature and apply themselves to the real world (Larson & Tran, 2014). There is, however, a great deal of complexity involved in the development of leadership skills in youths, and much of that complexity stems from the social system in which a youth is situated: factors such as family life and structure, education, personal ideals, personal traits, and behavioral and mental health all play a part in the extent to which leadership skills are acquired in adolescence. For many people, leadership is something that they define for themselves based on their own experiences. They see examples of leadership everywhere—in school, in films, in politics, in their families, in society, in sports, in their churches, etc. Their sense of what it means to be an effective leader is formed in part by the leaders they come into contact with and in part by the principles that are instilled in them as they mature. Thus, while theories of leadership and leadership styles may provide some guidance in how we think about leadership, the reality is that many people view leadership uniquely and compose a picture of a good leader that is based on several different reference points that are unique to their own experience. For me, my sense of leadership is based on the principles that I have taken to heart over the years and the examples of leadership that I have seen from individuals I admire. In many cases, the best examples of leadership I have received have come from my own mother and father. They have demonstrated numerous times how to lead, guide, instruct, assist, teach, inspire, motivate, and nurture and I feel that I would not be the person I am today without them. Their leadership has given me important values and taught me to set goals for myself so that my life has direction, purpose and meaning. Not everyone, however, will use my example of effective leaders to define their own concept of leadership. Some will turn to characters in books or in films; others will look to real life—to popular figures in the public realm who have demonstrated leadership abilities that can be emulated by others. Leadership does not have to mean or be the same thing for all people. What matters most is that we think about leading, think about what would effectively help others, what would induce a positive change or support in the lives of others, and then take the ideas obtained through that reflection and apply them in practice. This is ultimately all it takes to be a leader—to be thoughtful, mindful of others, thankful for one’s abilities, and desirous of seeing everyone obtain a good goal in the future. Even if one does not take on a leadership role in an organization, at some point everyone is responsible for leading their own lives. The responsibility inherent in leading one’s life is truly no different from the responsibility inherent in the leading of a company: in order to achieve positive returns, one has to invest in oneself and in one’s peers or community. Defining experiences will come to individuals over time and help them to refine the way in which they view themselves and the world around them. The key to growth is to continue aspiring to learn. In many industries, the concept of continuing education is important because it enables one to stay abreast of what is happening in the industry and how members of that industry can apply those lessons. In nursing, for example, nurse practitioners promote the concept of continuing education because it helps them to provide the latest in critical and quality care to patients. In real estate, agents are expected to complete so many hours of continuing education every year so that they stay abreast of the ethical, practical and legal requirements of their profession. For anyone in any walk of life, continuing education is a way to maintain a posture of integrity. This integrity can serve to cultivate an awareness of how integrated and interconnected all of life is, and how much the various elements of society depend upon one another. Stakeholders in communities, schools, businesses and organizations all play a part, either directly or indirectly, in the growth and movement of the individual members of these groups. Therefore, an individual who is open and awake to the way in which people impact one another is already capable of leading. Leading is about being aware, and building on that awareness will be the fruits of experience. These experiences will define for you, just as they do for all people, what it means to be a leader and how you can best effect leadership in your own surroundings. My personal leadership philosophy is based on the principles of servant leadership: I believe that in order to lead one should be able to set the right example for others. A leader must, therefore, possess the attributes that he expects and desires of others. A leader should also be willing to devote himself to his followers so that they can obtain their goals. Servant leadership places the leader at the service of his followers and promotes empathy, selflessness and devotion, which are characteristics of leadership that I find admirable. One’s personal leadership philosophy does not have to conform to another’s principles but rather should be an extension of the values that the individual himself holds dear and attempts to uphold in his own life. A personal leadership philosophy is much like a manifesto that helps characterize an individual and show others what it is important to them. An organization will typically consider a person’s leadership philosophy and how well it fits with its own culture before hiring the individual. And just because one’s personal leadership philosophy does not fit well with one organization does not mean that the individual will not be better suited with another group. Indeed, there are many different organizations around that world that have many differing views on leadership and values. As one grows and comes into contact with these different groups, he can decide upon a course of action that will place him with a firm that values and upholds the principles and ideas he himself deems important. Defining one’s values is a major step in becoming a true leader, as everything that one does will stem from the principles that serve as an individual’s moral and behavioral foundations. A person who has defined his values for himself cannot be a leader of others, because he will not have a sense of what it means to be committed to an ideal, a principle, or an objective. Definition is critically important to organizational success and thus crucially important to leadership. A leader must be able to define both for himself and for his followers the values of the organization. In conclusion, leadership is an integral part of human life. Leaders are evident in families, in schools, in workplaces, in churches, in social groups, and in one’s own life. Indeed, everyone must be a leader of his own life as he matures into an adult and makes decisions for himself. What makes a person successful in this regard is his ability to Challenge create, achieve, inspire, energize, assess and ultimately decide what is best for both himself and for his followers if he is in a position to have them. Leaders must be bold but they must also have good judgment. They must be able to communicate effectively and they must be capable of empathy. They must demonstrate emotional intelligence skills and be reflective so that they can consider multiple points of view and see how both they and their followers can benefit from objective criticism. Leaders must be focused on growth according to principles that inspire and motivate others to achieve clearly defined aims and objectives. For these reasons, leaders are essential to organizations and can help to transform an organizational culture that is depressed and dysfunctional into one that is positive, rewarding, inclusive, and successful. Leadership skills can be developed from an early age and are impacted both by natural talents and abilities and by personal experiences. Schools and youth programs can help train children and adolescents in acquiring leadership skills. Families and peers offer a social structure in which youth can practice and demonstrate leadership qualities and grow into a responsible adult capable of gathering information and making a good judgment. Complexity.” Journal of Youth Adolescence, vol. 43 (2014): 1012-1017. Sanders, Tim. The Likeability Factor. NY: Three Rivers Press, 2006. Print. Schyns, B., Schilling, J. “How Bad are the Effects of Bad Leaders? A Meta-Analysis of Destructive Leadership and Its Outcomes.” The Leadership Quarterly, vol. 24 (2013): 138-158. Cacamis, M. E., & El Asmar, M. (2014). Improving project performance through partnering and emotional intelligence. Practice Periodical on Structural Design & Construction, 19(1), 50-56. Day, D., Fleenor, J., Atwater, L., Sturm, R., McKee, R. (2014). Advances in leader and leadership development: A review of 25 years of research and theory. The Leadership Quarterly, 25: 63-82. Eubanks, D. L., Antes, A L., Friedrich, T. L., Caughron, J. J., Blackwell, L. V., Bedell-Avers, K. E., & Mumford, M. D. (2010). Criticism and outstanding leadership: An evaluation of leader reactions and critical outcomes. The Leadership Quarterly, 21(3) 365-388. Hunter, E. M., Neubert, M. J., Perry, S. J., Witt, L. A., Penney, L. M., & Weinberger, E. (2013). Servant leaders inspire servant leaders: Antecedents and outcomes for employees and the organization. The Leadership Quarterly, 24(2), 316–331. Marshall, S., Parker, P., Ciarrochi, J., Heaven, P. (2014). Is self-esteem a cause or . Child Development, 85(3): 1275-1291. Morton, M., Montgomery, P. (2013). Youth empowerment programs for improving adolescents’ self-efficacy and self-esteem: A systematic review. Research on Social Work Practice, 23(1): 22-33. "Leadership Essay (Free Example)." Aceyourpaper.com. Student Network Resources Inc, 13 April. 2017. Web. 18 April 2019. Student Network Resources Inc. "Leadership Essay (Free Example)." Aceyourpaper.com. 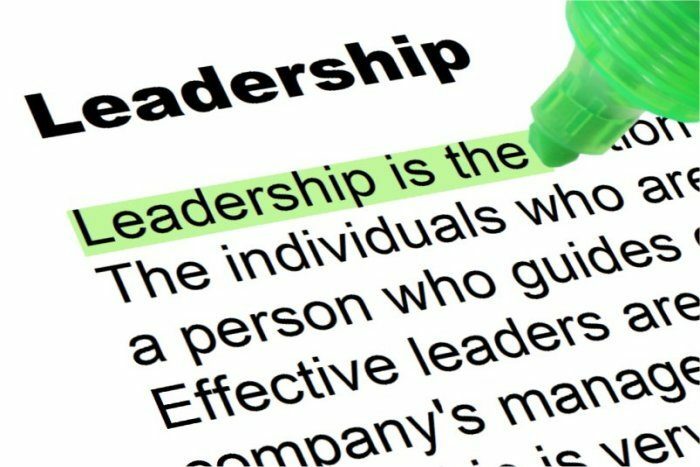 https://www.aceyourpaper.com/essay/leadership-essay/ (accessed April 18, 2019).